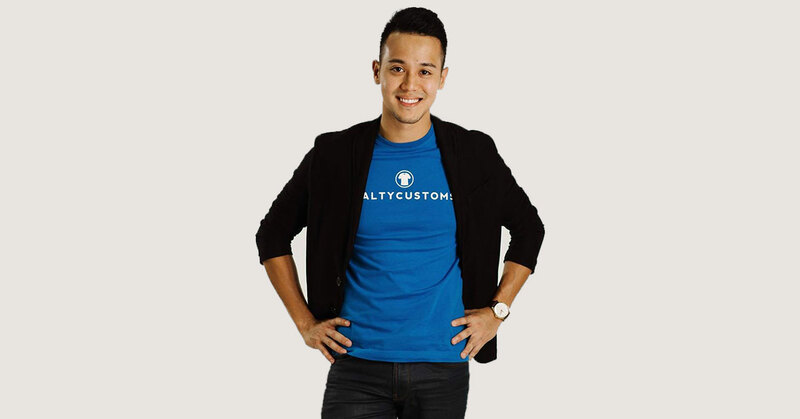 Since co-founding SaltyCustoms in 2010, King Quah has seen his business grow from fledgling custom tee manufacturer to local B2B powerhouse, with Grab, Facebook, and Coca-Cola among the names of distinguished clientele. Together with his long-time friend Shannon Toh (who has since moved on to numerous other projects), King first began SaltyCustoms with the idea to sell customised t-shirts to businesses with a focus on quality, fit, and design. Today, the brand has grown to team of 35 in two countries, including a number of key directors to help run the company. For those unfamiliar with King and his company, SaltyCustoms prints customisable t-shirts for businesses, usually in bulk amounts. They’re a one-stop service providing external businesses with all the necessities—design, manufacturing, and logistics. All this is done using an online platform that makes the experience seamless for clients. But while the model works well, it’s the principles behind the process that have made the difference. In a separate interview, the founders noted a special emphasis on “quality, consultancy, and experience”, and so far that emphasis has borne fruit. One of SaltyCustoms’ highlights includes being part of Facebook’s F8 Global Conference, where they required to manufacture and ship apparel to 26 countries within a set time frame. 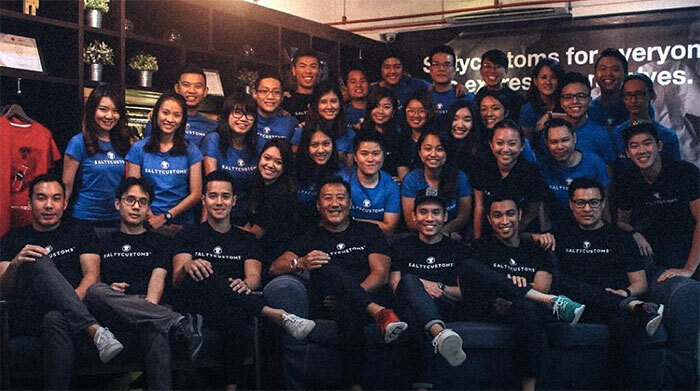 This comes in stark contrast to when SaltyCustoms was first founded with a meagre capital of RM6,000. “We feel very lucky, and are humbled to have come this far,” King added. But success is only half the story. To achieve success as an entrepreneur is no easy feat, something King himself will agree with. Over the years, the SaltyCustoms journey has taught its team a number of important values, chief among all being the boldness to stick with the vision that they started with at the beginning—to “be at the forefront of innovation in the apparel industry”. “Essentially, myself and the team made sure that we all came together to understand everyone’s version of the vision so that we could work together in making it come true,” explained King. King also testifies to the importance of having the right people in the team. “Hiring wrong people that do not fit the company culture is like trying to force a square peg into a round hole. It’ll eventually take a toll on both the employee and employer,” he said. It’s all to do with two intrinsic values. On running his business, King cites growth and innovation as the two pillars behind everything he does. King also attributes the success of SaltyCustoms to his team, with whom he has always been able to reaffirm the company’s goals and visions. With all these values filtered down into the core of the company, SaltyCustoms has positioned itself as more than just a custom t-shirt business, instead wanting to be more of a platform to “help businesses launch their brand to the next level” by ensuring quality every step of the way. “We treat our clients as partners and make sure that we bridge the gap between retail fashion and company apparel,” King said. There’s also more coming from SaltyCustoms. 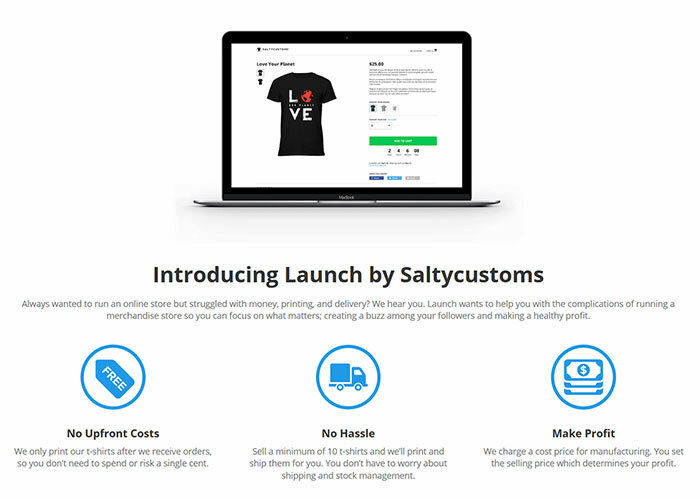 Speaking on the future and possible expansions, King was keen to mention LAUNCH, a new feature under the SaltyCustoms brand that enables users to create and sell t-shirts to anyone with no upfront cost. “It allows creatives, influencers and designers to put up their ideas and start a full-fledged campaign to sell merchandise,” he said. This all happens with SaltyCustoms taking care of printing, manufacturing, and logistics; allowing anyone to kickstart their business in a hassle-free manner. According to King, starting LAUNCH was a very natural and organic idea. “We realised that campaign launching to sell merchandise was picking up in America but there were several gaps that we believed we could plug and the idea for LAUNCH was born,” he said. LAUNCH specialises itself by working closely with its clients to create designs and deliver them. And some of the challenges it currently faces is capturing the essence of the brands or influencers working with the service as closely as possible. Since starting LAUNCH, King says that they have managed to gain a foothold Asia, China, America, and some parts of Europe, something they hope to capitalise on in the coming year. All said, 2018 is shaping up to be a big year for SaltyCustoms. On entering 2018, King is adamant that the next year will prove to be SaltyCustom’s biggest year yet, and tells everyone to expect great things from the company. Firstly, they hope to improve on things at SaltyCustoms by innovating on the current process and upgrading the supply chain, making life better for all involved. As for LAUNCH, King says that they hope to iron out the kinks before making the service available to the public. Then there’s also the relaunch of Doobie—the mobile app that allows users to upload t-shirt designs and get them individually printed—to look forward to. And last but not least, SaltyCustoms also has plans to expand into Australia within the first quarter of 2018. Lastly, King also has advice for would-be entrepreneurs. “It is important to remember that we are all on our own journey and not compare with others,” he advised.